With more than 10 years experience in WordPress web design, I’ve developed resources, honed skills and created partnerships that you’ll benefit from as I’m building your website. My focus has always been on building websites that work. Your colleagues and readers will be able to find who you are and what you’re doing. When it comes down to it, your site will be like your best teacher assistant. You’ll tell it what to do and it will just work! My websites are designed to showcase the content your readers need. After all, you want your readers talking about your awesome blog posts, not how pretty your website is. I offer a free 30-minute consultation to web design prospects, during which we’ll will work together to determine which of our services will best suit your needs. I will then send you a contract that clearly spells out the terms of our agreement and the specific tasks I will complete as part of your project. Once I receive the signed contract, payment and the materials needed to start the project, I’ll begin work. If you have ordered a site design or design customization, I will provide one concept based on the information you provide during our consultation. 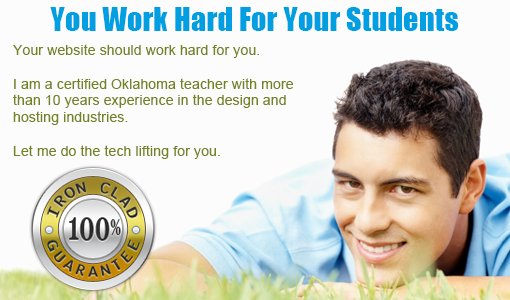 I’ll also provide up to two rounds of design revisions to the initial concept to insure that you receive the design that will best showcase your teaching expertise. Once you sign the final approvals, I’ll hand over the keys to your brand new website! So, if you want a website that actually works, take a look at our packages. Enter To Win Our WordPress Blog Contest For Teachers! *You will need to provide your own hosting account. I highly recommend Reliable Webs. I have personally used their services for more than five years. Scott and Kelly have been amazing service providers the entire time. They live up to the standard I set for myself when I ran a web hosting company. They are well worth the monthly payment. That said, if you can’t swing $13 per month, try HostGator. At HostGator, use the coupon code MRSWATERSENGLISH for 25 percent off your first payment! **If you are chosen as the contest winner, you will receive an email notification, and I will announce on my blog when I have chosen a winner. I am currently choosing up to 1 winner per month. You are welcome to rework your application and submit again if you’re not chosen. Sometimes you just need a plugin installed or a small tweak to your theme. Our ala cart services offer just what you need. If you can’t find what you’re looking for, contact us and we’ll send you a quote. If you haven’t setup a Facebook page for your blog (or customized the one you have), you’re missing out on an opportunity to connect with your members and prospects where they’re at. As part of this package, we’ll provide a 30-minute consultation to find out what your goals are, then setup your page, create a custom welcome tab, add application, add content to the left sidebar and more. In today’s world, you need a website that’s more powerful than what static pages or offline content management systems can offer. Contact us for a quote and we can work with you to get your website converted to WordPress at an affordable price. WordPress & Plugin Updates — $15/mo. WordPress updates frequently every year. Some updates are security fixes while others introduce new features or repair bugs in existing functions. On top of that, each plugin must update regularly to remain functional. Tech Geeks keeps up with all the updates and verifies that each update is compatible with your current version of WordPress. Let us take care of the updates for you!